Rodney grew up on a farm in rural New South Wales. A chef apprenticeship eventually led him to Sydney where he worked under Tetsuya Wakuda at his esteemed restaurant, Tetsuya’s. After completing his chef apprenticeship Rodney moved into food media, developing recipes for most of Australia’s food magazines, working as Food Researcher for the Better Homes and Gardens television program and in 2004 authored a cookbook entitled Roasting. His latest book, published in October 2013 by Lantern (an imprint of Penguin) is entitled The Agrarian Kitchen. 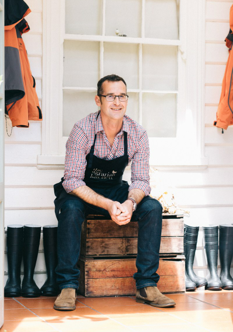 It contains 100 recipes and talks about his move to Tasmania to set up The Agrarian Kitchen. Rodney has taught cooking classes for the Sydney Seafood School, Simon Johnson Providores and Accoutrement. He was a Food Editor for Australian Gourmet Traveller magazine from October 2004 to June 2007 and is currently Contributing Food Editor, writing recipe features for the magazine.